In the psychological study of learning, there has been a lot of research on how to reinforce behaviours. Of particular interest is the timing of rewards. If you want someone to keep doing something, do you reward them every time they do it? Or do you reward them only some of the time? This is why gambling is so addictive. You get rewarded for pulling that lever, but randomly and only every so often. It may also be why checking email can be addictive. Clicking that inbox gets rewarded with a message, but only sometimes. I think this also applies to ice cream. As we all know, the best part of many ice creams is the chunks. Vanilla ice cream is OK on its own, but in a spoonful with a nice big chunk of cookie dough or a brownie bit, it’s infinitely more rewarding. 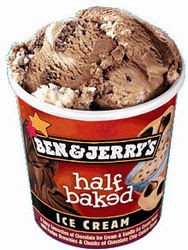 But usually, in a tub of, say, 100 spoonfuls, there can only be, say, 25 spoonfuls that contain yummy chunks. And since the chunks are randomly distributed throughout the tub of ice cream, each spoonful only has about a 25% chance of containing a chunk. If eating a spoonful of ice cream is the behaviour and chunks are the reward, this is what we call a VR4 (variable ratio 4) schedule; reinforcement is random, but on average, every 4th behaviour is rewarded. It’s the perfect recipe for making someone eat ice cream quickly, and keep eating it. This is why I eat so much ice cream. It’s friggin’ science. And while I often complain that there are not enough chunks in ice cream, it’s clear that ice cream manufacturers have outsmarted me. It wouldn’t be quite so addictive if every spoonful had a chunk. It’s also why you shouldn’t eat right from the tub. With the magic of psychology at work, you would probably eat the entire tub in the time it takes to, say, write a blog post about the psychology of ice cream. P.S. If you do a Google image search for “Reese ice cream”, you will find a surprising number of pictures of Reese Witherspoon eating ice cream. She, too, must be a victim of variable ratio reinforcement.